دادور خانی, فضیله, دربان استانه, علیرضا, نجارزاده, محمد, ترابی, ذبیح الله, هاجری, بهرام. (1397). بررسی فضایی عوامل مؤثر بر ضریب مکانی اشتغال زنان روستایی ایران در بخش خدمات. 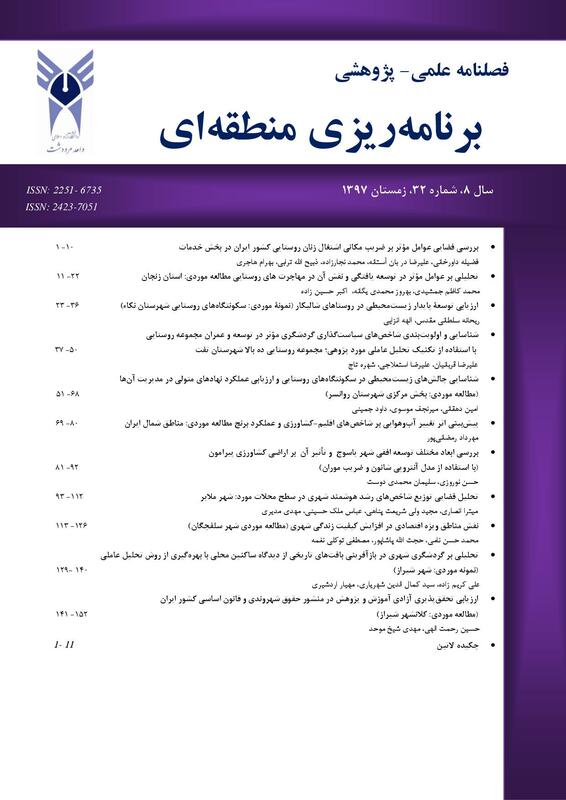 فصلنامه علمی - پژوهشی برنامه ریزی منطقه ای, 8(32), 1-10. فضیله دادور خانی; علیرضا دربان استانه; محمد نجارزاده; ذبیح الله ترابی; بهرام هاجری. "بررسی فضایی عوامل مؤثر بر ضریب مکانی اشتغال زنان روستایی ایران در بخش خدمات". فصلنامه علمی - پژوهشی برنامه ریزی منطقه ای, 8, 32, 1397, 1-10. دادور خانی, فضیله, دربان استانه, علیرضا, نجارزاده, محمد, ترابی, ذبیح الله, هاجری, بهرام. (1397). 'بررسی فضایی عوامل مؤثر بر ضریب مکانی اشتغال زنان روستایی ایران در بخش خدمات', فصلنامه علمی - پژوهشی برنامه ریزی منطقه ای, 8(32), pp. 1-10. دادور خانی, فضیله, دربان استانه, علیرضا, نجارزاده, محمد, ترابی, ذبیح الله, هاجری, بهرام. بررسی فضایی عوامل مؤثر بر ضریب مکانی اشتغال زنان روستایی ایران در بخش خدمات. فصلنامه علمی - پژوهشی برنامه ریزی منطقه ای, 1397; 8(32): 1-10. از آنجایی‌که زنان نیمی از جمعیت روستایی کشور را تشکیل می‌دهند؛ می‌توان با شناسایی عوامل مؤثر بر اشتغال با توجه به مقتضیات محلی- منطقه‌ای و در نهایت درگیر نمودن پیش از پیش آن­ها توسعۀ اقتصادی- اجتماعی کشور را تسریع نمود. بر این اساس، در این پژوهش سعی شد با استفاده از رویکردهای تحلیل اکتشافی داده‌های فضایی به تحلیل الگوی توزیع فضایی ضریب مکانی اشتغال (LQ) زنان روستایی ایران در بخش خدمات پرداخته شود. داده‌های پژوهش از سرشماری عمومی نفوس و مسکن سال 1390 استخراج ‌شده است. برای تجزیه‌وتحلیل داده‌ها از آماره‌های محلی به‌عنوان رویکردهایی از ESDA استفاده‌ گردید. یافته‌های شاخص موران سراسری نشان داد توزیع فضایی ضریب مکانی اشتغال (LQ) زنان روستایی بخش خدمات کشور به‌صورت اتفاقی یا پراکنده نبوده است؛ بلکه به‌صورت خوشه‌ای توزیع‌شده است. نتایج تحقیق بیان می‌کند که مناطق شمال، شمال غربی کشور شامل بخش‌های از استان‌های تهران، قم، سمنان، مرکزی، همدان و مازندران از نواحی پایه و نیز به‌طور عمده در شمال غرب کشور شامل استان‌های آذربایجان شرقی و غربی، اردبیل و کردستان از نواحی غیر پایه، در زمینهٔ اشتغال زنان روستایی در بخش خدمات می‌باشند. توزیع فضایی ضریب اقتصاد پایه و ارتباط فضایی آن با نرخ باسوادی و نرخ روستانشینی با استفاده از خودهمبستگی سراسری نشان می‌دهد ارتباط فضایی نرخ باسوادی و نرخ روستانشینی با ضریب اقتصاد پایه در مناطق روستایی ایران از یک الگوی خاص پیروی نمی‌کند، بلکه هر منطقه با توجه به مقتضیات محلی- منطقه‌ای الگوی خاصی از ارتباطات را پذیرا هستند. "اشتغال زنان؛ "تحلیل فضایی؛ ""ضریب مکانی (LQ)"؛ "روستاهای ایران"
In rural regions, due to women's significant role, paying to the status of their employment and guidance them to market can provide the situation of better usage of rural society from this potential force. In fact, to identify the current status, factors influencing participation according to local-regional needs and ultimately, to increasingly involve them can provide local economic development and consequently, the national economy. Accordingly, in this study using the exploratory analysis approaches of spatial data, we tried to analyze the spatial distribution pattern of basic economy (LQ) of Iran's rural women in the services sector. The data is extracted from the 1390 population and housing census. For data analysis, local and global statistics Moran's I and LISA as approaches from the ESDA are used. The results indicate that the northern and northwest of the country, including parts of the provinces of Tehran, Qom, Semnan, Markazi, Hamedan, and Mazandaran are from basic areas, and mainly in the northwest of the country, including the provinces of Eastern and western Azarbaijan, Ardabil, and Kurdistan are from non-basic parts, in the field of rural women's employment in the service sector. Also, the results from global Moran's index showed that the spatial distribution of basic economy (LQ) of rural women in the services sector has been distributed as cluster. Spatial distribution of basic economy coefficient and its spatial association with literacy value and pastoralism value using global self-correlation shows that spatial association of literacy value and pastoralism value with basic economy coefficient in Iran's rural regions does not function from a certain pattern, but each region accepts a certain pattern of associations due to local-regional needs. "employment Women’s, " "spatial analysis, " "locative quotient (LQ)", "rural of Iran"
Becker, G. (1965), A theory of allocation of time, Economic Journal, 75,Page 493-517. Cavalcanti ,Tiago V. de V. and Jos´e Tavares(2005), Assessing the “Engines of Liberation”: Home appliances and female labor force participation, web.ics.purdue.edu/~tcavalca/ research/ EnginesofLiberationOct2005.pdf, Page 1-14. Cavalcanti,Tiago V. de V and Jos´e Tavares(2004), Women prefer larger governments: Growth, structural transformation and government Size, web.ics.purdue.edu/~tcavalca/ research/ WGCavalcantiandTavares.pdf, Page 1-24. Del Boca, D. and M. Locatelli, S. Pasqua(2000), Employment Decisions of Married Womens :Evidence and Explanations,CHLD Working Papers, n. 8, page 1-20. Hartley, M., Popay, J., & Plewis, I. (1992). Domestic conditions, paid employment and women's experience of ill‐health. Sociology of Health & Illness, 14(3), 313-343. Jackson, C., & Pearson, R. (2005). Feminist visions of development: Gender analysis and policy: Routledge. Kottis, A. P.( 1990). Shifts over time and regional variation in womens labor fore participation rate in a developing economy: The case of Greece, Journal of development economics,Vol.33. Kozel, V. & H. Alderman (1990), Factors determining work participation and labor supply decisions in Pakistans Urban Areas, The Pakistan Development Review, 29 (1),PP 1-17. Lazar, M. (2005). Feminist critical discourse analysis: Gender, power and ideology in discourse: Springer. Mammen, Kristin and Christina Paxson(2000) , Women’s work and economic development, Journal of Economic Perspectives, Volume 14,Pages 141–164. Sultana, N., H. Nazli, and Malik (1994), Determinants of women time allocation in selected districts of rural Pakistan, The Pakistan Development Review, 33 (4),Page 1141-1153. Tansel, A. (2002). Economic development and female labour force participation in Turkey: time series evidence and cross provinceestimates, in Bulutay, T. (Ed. ), Employment of Women. Ankara:State Institute of Statistics,51-111. Tansel, Aysyt (2002), Economic development and female labour force participation in Turkey: Time – series evidence and cross-province Estimates, ERC Working Papers in Economics, 01/05,Page 1-37. Vendrik,Maarten C.M. (2000) , Bandwagon and habit effects on female labour force participation, ciclamino.dibe.unige.it/ wehia/papers/vendrik.pdf ,Page 1-30.